6 ShamTastic Towels only $5.99 w/ Free Shipping! Right now at Amazon, you can get 6 ShamTastics for only $5.99 with free shipping! I have a few of these and they work great. I use them ALL the time and they save a lot of money on paper towels! These towels absorb like a sponge, wipe like a towel and dry like a shammy. 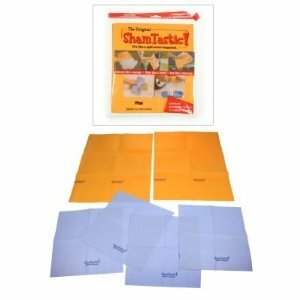 Absorbs more than 10 times its weight in liquid, durable, machine washable comes with 6 cleaning cloths. Use wet or dry for many uses including kitchen and floors clean ups, cars and boats, dusting and polishing and to quickly absorb carpet spills.